Performers include: Donnie Wahlberg, John Leguizamo, Steve Cirbus, Michael Hogan, Adam Cantor, Geoffrey Cantor, Jeremy Davidson, Jennifer Ferrin, Frank Grillo, Wayne Kasserman, J.D. Williams, Ryan Sands, Nick Koesters, Patrick Jordan, Nick LaMantia, and Andrew McCune. After returning from the war in Iraq, Jake “Mr. Wolf” Mendez (John Leguizamo) and a team of his fellow Marines conspire to rob a major bank in Pittsburgh. His expert team includes Corporal Henry “Mr. Rabbit” Roman (Jeremy Davidson), Private Albert “Mr. Pig” Roman (Frank Grillo), Private Michael “Mr. Mouse” (Leo Fitzpatrick), Marshall “Mr. Cat” O’Brien, Jr. (J.D. 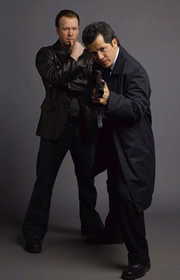 Williams), and Deke Quinlan (Steve Cirbus). When things go wrong, the situation escalates and the troops are forced to take hostages including bank manager Abe Shelton (Geoffrey Cantor), wealthy Ashley Beck (Christine Evangelista), defense attorney Leroy Barnes (Ryan Sands), electrician Rocko (Adam Cantor), elderly Bernard (Bingo O’Malley), widow Chloe (Jennifer Ferrin), security guard Henry (Adam Kroloff), and Teddy and Robby Sabian (Peter Appel and Ethan Rosenfeld), a father and son. Wolf is pushed to the breaking point as he finds himself battling the police, the hostages, his team members, as well as his own personal demons. On the outside, Hostage Negotiator Captain Horst Cali (Donnie Wahlberg) has his own set of problems as he tries to safely free the hostages before the FBI takes over the volatile situation. Under the command of Chief Nolan Abrami (Michael McGlone), Horst works alongside SWAT team members like Commander Connie Reubens (Michael Hyatt), sniper Quincy (Michael K. Williams), and Hawk (Michael Hogan).